Glen David Andrews is a rising star in the New Orleans firmament. But there are rising stars and there are RISING STARS. In fact, he was inducted into the Louisiana Music Hall of Fame as a “Future Hall of Famer” in November, 2010. He has recorded a gospel album and a traditional jazz album, but is just as likely to drop some funk into his performance. You may have seen him in HBO’s Treme. 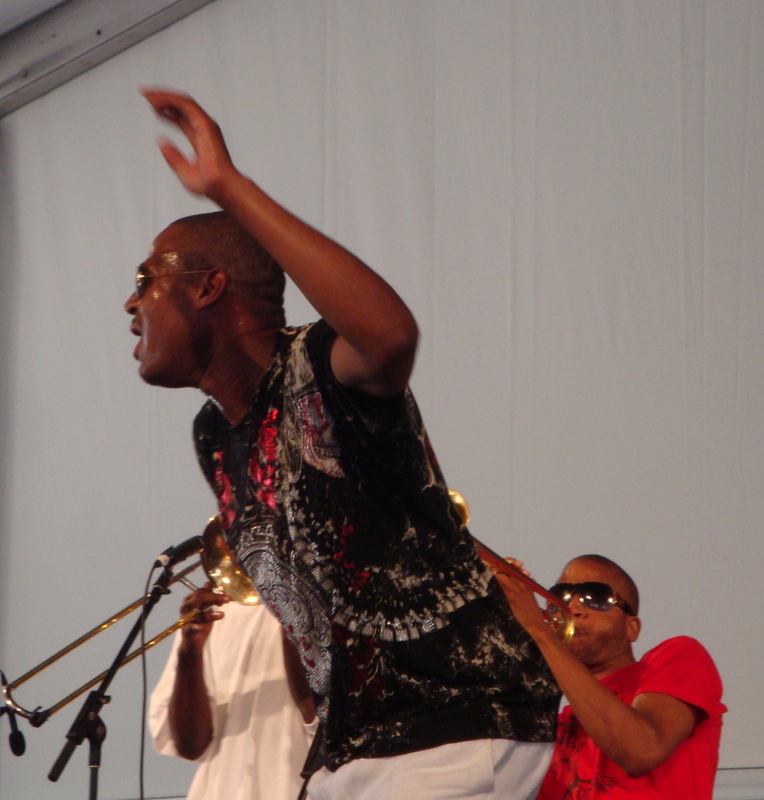 The charismatic trombonist with a deep baritone voice first came to the attention of folks outside of the Big Easy at the 2009 Jazz Fest, where he electrified the Gospel Tent, singing traditional gospel songs with a brass backing. People were jumping up and down, reaching out to touch him. He implores folks to get up, move, scream, and they willingly do so, as he proved at his performance at the Dakota Jazz Club and Restaurant the evening of this interview. Normally polite Minnesotans were on their feet as soon as he came on stage. They stood throughout the performance and shook whatever they had, mightily. It was a sight to behold. Earlier in the day, he came to the studios of KFAI, where this on-air interview was conducted. It’s been slightly edited for clarity. GDA: Good Morning. How’re you feelin’? LE: I’m feeling good How’re you feelin’? LE: You grew up in a highly musical family, a network of musicians. Jessie Hill was your grandfather, and your cousins are James Andrews and Trombone Shorty, so it seems you grew up around music. GDA: I grew up in the historical Treme neighborhood, which is the oldest black African American neighborhood in the US. It’s where jazz was founded. I literally walk up Basin Street every day, and while I’m walking up Basin Street, I get to play the song Basin Street. I am part of a huge musical family with James and Troy. Grandfather was the great Jessie Hill, who as you know, wrote the catalogue for Ike and Tina Turner, Sam and Dave, and his own stuff. Being born and raised in Treme, twhen I grew up in the 80s, I was blessed to have the privilege of seeing the end of all those guys that brought the revival of traditional jazz back. And I was able to see that, and I was able to see their jazz funerals and I still was able to play with some of them. I’ve been around it all of my life, and I’m pretty much in heaven right now. LE: Was there ever a time when you didn’t think of being a jazz musician? GDA: Nah. You walk out the door of my place in Treme, and my grandmother ran two of the most popular bars in town. So my entire life was surrounded by music, including my cousins, and my brother who played in the Rebirth Brass Band. His mother used to do Fats Domino’s hair, (she was) his exclusive hair dresser. Across the street, the preacher is my first cousin, and has a huge band in music. So I’ve been around it all my life. I can actually remember when I first saw the Olympia Brass Band, I knew I was gonna be a musician. LE: How did you choose the trombone? LE: You brought your trombone with you. GDA: Oh, everywhere I go. This is my wife. LE: You ready to play something? GDA: We have to play something to wake y’all up this morning. I hope you enjoy it. LE: That’s a very traditional song. You’ve been called someone who has one foot in tradition and one foot in the future. GDA: Being born in the neighborhood I was born in, and being around all those great musicians, I pretty much understood what traditional jazz was all about. Going to Preservation Hall, listening to the Humphrey Brothers. Actually knowing them, and being able to perform with so many great musicians You could do football, you could do basketball, but for me it was always music. But then, being around all those old people, I was hearing stories of who they were, who they hung out with. All those huge jazz stars were still in the neighborhood, because all their band members, and their friends lived around there. It’s a cesspool of culture. LE: What do you hope to do with your music? GDA: For me, I hope to take it to higher and higher heights. You know there’s many different ways I could go, but for right now it’s all about different kinds of music, especially with the CDs. I did a gospel, a traditional jazz, just did a live one, kind of funk. Now it’s time for blues-rock. I’m pretty much touching on every genre of music and being able to record with everybody and hopefully be able to do one-night stand around the entire world. LE: That’ s very ambitious. I saw you last year at the Jazz Fest last year just tearing it up at the gospel tent, and then I saw you a few nights later at the d.b.a club, creating a ruckus there, so that’s entirely a possibility. GDA: I think as long as I keep the right band. You have to be willing to open your mind up to new music, and, at the same time, new music is always great, but you still have to swing those tunes like Tiger Rag and Muskrat Ramble. You can’t let those tunes die off. LE: You’re playing at the Dakota this weekend. GDA: That is huge, for me to be able to play there. When I walked into the Dakota last night, it was pretty late and they treated us extremely wonderful. But to walk in there… I had just talked to Gaynell and Cyrille Neville, of the Neville Brothers. Cyrille is one of my mentors and someone who’s been a big inspiration and who’s had a big impact on my life. The first thing his wife told me was “You are really making a way for yourself, because you’re playing at the Dakota Jazz Club.” The first thing I told her was, “I ain’t never been to South Dakota.” She said “No, the Dakota Jazz Club.” I looked it up. After 25 years they have everyone playing, even Mavis Staples has come here. LE: They’ve got Dr. John coming up, the Preservation Hall Jazz Band. GDA: It feels good for me to be here this weekend. I think I should be playing in top jazz clubs and look forward to everybody getting me back up here. But first I want to woo y’all to convince you, yeah we’ve got the right one. LE: do you have another tune to convince us? GDA: Oh yeah, this is a great tune. We’re gonna try this one and we’re gonna dedicate this to my ex-wife. LE: You have a way of improvising words that works quite well. GDA: I believe that music is always telling a story and you can’t always tell the same story. But to improvise is what God is putting in your heart and your mind. Sometimes there’s a certain way to move your trombone, but sometimes I just like swinging it. I just take the feeling and duplicate it through the notes in my horn and in my voice. And if it tells me to scream, I’m gonna scream, and if it tells me sing low, I sing low. My goal is to make you cry, laugh, be happy, swing, dance, that’s what I’m here to do. And until I do that, my day is not done. LE: there might be some folks who can’t make it to the festival but want to learn more about you. Do you have a website? GDA: You can always go to GlenDavidAndrewsband dot com. Our website is always updated, but we stay in touch with everybody through FaceBook, which has a Glen David Andrews page. What we’re trying to do is get one hundred thousand people all over the United States to sign up for my Facebook between now and the time we release the next record, and we’re asking everybody to submit songs they think I should sing, mostly from Levon Helms. So if you know some great Levon Helms songs, please send them in to me, and when we tally up the votes in a few months, the ones they pick are the ones we’ll do, only with our arrangements. LE: We have to close off. Thank you for being here. GDA: Thank you for having us. This entry was posted on Wednesday, December 8th, 2010 at 6:37 am and is filed under Uncategorized. You can follow any responses to this entry through the RSS 2.0 feed. You can leave a response, or trackback from your own site.